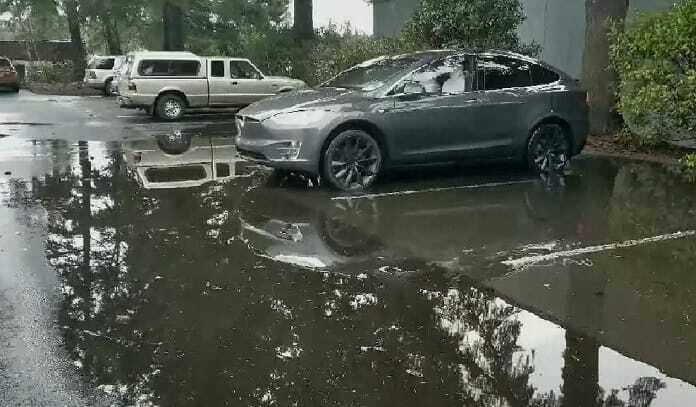 This is probably the best video of Tesla Summon feature showing Model X driving itself out of a puddle to its owner. When was the last time you have used the Summon feature on your Tesla? This video of Model X shows perhaps the most useful time a Tesla owner can use the Summon feature. Someone posted this video of Tesla's Summon feature in action on Reddit. It became so popular. More than 40,000 people have voted it up. In the beginning people thought the Summon feature was only good for parking your Model S on its own with no driver in the seat. But quickly people realized that this feature can have other uses as well. For example this video shows an auto-parking inside a narrow garage. But today's video of Summon feature is very cool: especially with the door opening as you approach. It's almost like "good evening sir, we had a little rain in your absence and as I trust you wanted to remain dry, here is little help for you." Tesla apparently is also excited about this use of the Summon feature and tweeted the link to the post on Thursday. This is probably Tesla's response to the Model S crashing into a fire truck while reportedly in the semi-autonomous Autopilot mode. By the way this Summon video looks sped up a bit however it still doesn’t take that long in real time. Especially with no close obstacles like a garage door. Now I start really to question whether necessity is the mother of invention. Some people already say that laziness these days pushes more inventions. And too much comfort will not be good for humans. Currently the Summons feature mostly drives just strait lines. But in the future it may meet you at your door. What are some of the most creative ways you have used your Tesla's Summon feature? Please write your opinions in the comments section for discussion. If you have fun videos email them to Torque News. They may appear in our future stories. Anytime someone has parked too close I use my Tesla Model S Summon feature. I use it frequently in tight parking lots. Last fall I parked in my driveway and it started pouring rain. I had to leave. I just summoned it into my garage and then left.